Yes, there are a lot of toys you can make for your dogs using items in your home. 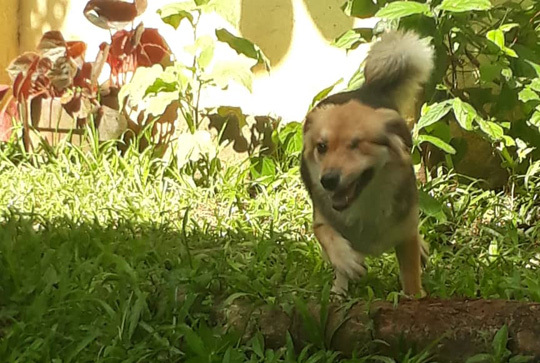 Rida, a rescued dog of Save Animals of Love and Light (Save ALL) who lost one eye when she was hit by a vehicle, loves to run in the garden like any other dog. But she also likes to lie down in the garden to enjoy treats and toys. “Wanting to make your pooch’s own toys goes way beyond a simple urge to save money—it’s fun too!,” says Kayla Fratt in DIY Dog Puzzle Toys: Challenging Toys You Can Make At Home in K9 Of Mine web site. It is important to keep your dog’s body and brain active so that your dog will remain healthy and happy. “The overall benefits of play for your dog can never be underestimated. Active dogs are both happier and healthier than dogs who do not get the same amount of exercise—that’s why it’s always recommended to take your dogs on regular walks.,” says Fratt. “Without sufficient stimulation, dogs are bound to get bored, and your favorite pillows or shoes may suffer as a result (bored dogs tend to be prone to nervous behavior which can be perceived as being—for lack of a better term—naughty),” Fratt stresses. A lot of puzzle toys and treat dispensing toys are available in pet stores and vet clinics but they can be very expensive and not all are safe for your dogs. You can make a stuffed toy for your dog. Cut a fabric, put cotton or used clothes inside, then sew by hand. You can go to the internet to look for patterns if you want. There are also instructional videos available in the net. When the stuffed animal is finished, you can turn it into a puzzle. “All you have to do is sew a small ‘kangaroo pocket’ somewhere into the toy—make sure your dog can practically fit their nose and/or paw in there—and hide your treats in there, “ Fratt says. Some dogs can destroy even toys that are advertised as indestructible. “For that, consider making your dog a nearly indestructible chew toy made from dried sweet potato and rope … The process is pretty self-explanatory: Dry the sweet potato and attach them to the rope, knotted in-between for each piece. This is great especially great for dogs who are teething,” Fratt says. This is a spin-off from the find-the-treat game that lots of dogs have fun playing with. “In this case, cut a small hole in a tennis ball—and by small, we mean big enough for them to be able to get treats out, but not big enough for them to just fall out. You might be surprised to find that your pooch appreciates the challenge, “ Fratt says. Another spin-off from popular dispensing treats which keeps dogs occupied is a bottle spinning toy. “These instructions from Hallmark guide you through how to build a basic frame (which can be constructed from wood or PVC-piping with a little bit of imagination and DIY-prowess), and the dispenser itself: Three bottles with holes drilled through them, tops off, able to be tipped forward or back by your pet,” Fratt says. Fratt adds,”The guide recommends that you always supervise your pet while they’re making use of the dispenser or you might come home to a floor full of debris—or treats absolutely everywhere. "Another cool puzzle toy provides more mental exercise," Fratt says. “For this game, all you have to do is get some PVC piping (from your nearest hardware store), drill some holes in the side, put on the end-caps and, well, throw treats into the one end. PVC piping has the benefit of being both cheap and way more durable than cardboard, “ Fratt says. “And guess what? Research has shown that dogs who are kept mentally active are much healthier in old-age and less likely to develop dementia later on. Hurrah!, “ Fratt shares. Fratt suggests you get an unused cupcake tin and a couple of tennis balls. “And, of course, you can’t forget the treats for this – reward is an essential part of dog training and learning; plus, it’s half the fun, “ she says. “Place the treats inside the muffin tins and simply stick the tennis balls over the treats. It’s up to your dog to figure out how to get to the treats, and for variety, you can change-up the configuration (or change it up completely by not using tennis balls next time), “ Fratt says.